gfoster: (Geoff Foster, sports editor): NFL Week 14 was very odd in many respects (and the week isn’t over) with the Raiders, Niners and Giants winning and the Rams, Texans, Steelers and Patriots all losing. It all went a long way to making the playoff picture even murkier. What was your biggest takeaway from the week? Salfino (Michael Salfino, contributor): How much should we be worried about the Rams? Is every offense entitled to one hiccup like this, or is it part of a pattern that began with the Lions, who did not care about play-action at all and just covered the receivers. The Bears also did not bite. Does Los Angeles have a Plan B? neil (Neil Paine, senior sports writer): It was definitely startling to see the Rams’ offense be held in check so thoroughly. Jared Goff was terrible. Todd Gurley did next to nothing. The Rams’ offensive expected points added in the game was -23.5. That was 29.6 points worse than their second-worst offensive game of the season … which was Week 13 vs. Detroit. 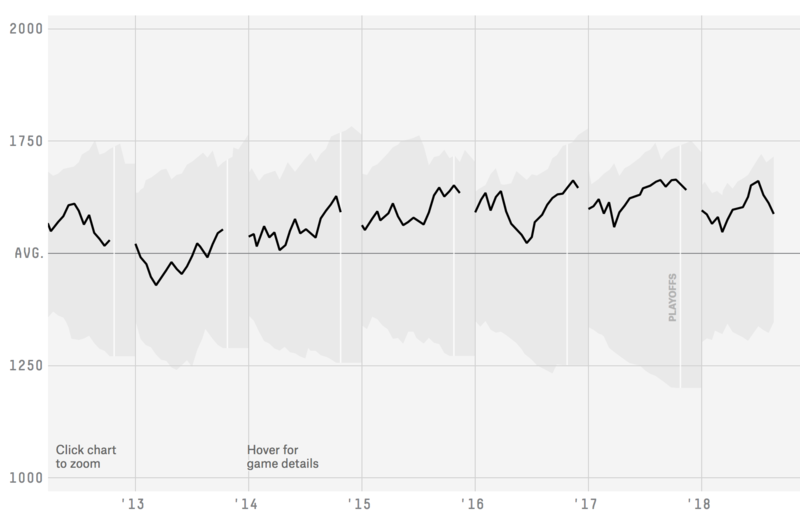 And it was 33.8 points of EPA worse than their low before the Detroit game. sara.ziegler (Sara Ziegler, assistant sports editor): I know people talk a lot about playing in the cold as a problem, and I usually roll my eyes. But was that a factor here? neil: The Rams have only played four games where temp was under 50 degrees in the Sean McVay era. Salfino: I know, that temperature stuff. I just can’t believe these guys from all different parts of the country are suddenly able to only play in warm weather. But that’s going to be the theory of the case now almost certainly. gfoster: The Rams game at Detroit was definitely curious. They came out of the bye completely flat, Goff played poorly, and most people kinda wrote it off to rust. But now I’m starting to wonder if teams, as Mike alluded to, are starting to figure out this McVay offense. Salfino: This kind of thing has happened before. The 1994 49ers team that won the Super Bowl and was electrifying on offense laid an egg against the Eagles that year, losing 40-8. They had 189 yards that game. And on defense, the 1985 Bears famously flubbed a primetime game against the Dolphins late in the year for their only loss that season. gfoster: That Detroit game was in a dome, Sara. Salfino: This can’t be Cooper Kupp, can it? My theory of playing the Rams was to just ignore the running game. I figured a team that gave them fits would basically concede Gurley. What really surprised me about the Chicago performance was that Gurley didn’t even get going. They had nothing. The Bears didn’t even accept the slow death of Gurley running. sara.ziegler: But why didn’t the Rams even try to run Gurley? Only 11 carries? neil: Good question, Sara. They had been almost exactly balanced (49.7 percent pass/50.3 percent run) on first down, but last night they passed on 73 percent of first downs. Despite averaging 4.6 yards per carry on the first downs where they did run. Salfino: My feeling watching the game with Gurley is that the Rams wanted to get wide open passes by faking to Gurley like they usually do, and then when that didn’t work, they were behind the down and distance and had to straight-up pass, with typically disastrous results. neil: Right — Goff had a 23.0 passer rating on 1st down. Salfino: What happens to a play-action offense when no one buys into the deception? When the defense just ignores it? sara.ziegler: I guess I would argue that you should just run the ball. Especially with a guy like Gurley. Salfino: Exactly right. That’s when they should run. This is probably why McVay was so hard on himself in the post-game. gfoster: Let’s talk about the ending of the Dolphins-Patriots game, which was probably the highlight of the year. Although, I may be partial to the Chris Carson front flip a couple weeks ago. Longest game-winning scoring play in NFL history, I believe. Salfino: Kenyan Drake made the best nonlateral decision ever on a lateral play. Or maybe the worst since anyone other than Gronk easily tackles him. sara.ziegler: Gronk definitely failing his defensive audition. Salfino: Why was Gronk even on the field? It was not a Hail Mary situation 69 yards from pay dirt. neil: Right, clearly Ryan Tannehill doesn’t have the arm for that throw in the air. He’s not Patrick Mahomes. gfoster: Tannehill can throw 80 yards. You didn’t know that? Salfino: Did Drake just laugh at the idea of Gronk tackling him? Gronk looked like I imagine Brady would trying to make that tackle. And ironically, he finally looked like Gronk on offense. neil: And Bill Belichick left Devin McCourty off the field for that play in favor of Gronkowski. Shades of Malcolm Butler in the Super Bowl. Too cute for his own good. sara.ziegler: I just need to take a second to thank Drake for giving me 12.2 fantasy points on that play. Salfino: Fantasy scoring on that play is hilarious. It goes as a Tannehill touchdown pass. There were no screams about that because who’s playing Tannehill? Salfino: How dumb are the Dolphins though for not getting a guy as electric as Drake the ball more on offense? But they’re 7-6. Have to be one of the worst winning teams at this juncture of the season in memory, but they do own wins against the Bears and Patriots. gfoster: Salfino is not a Frank Gore fan. Salfino: OMG, Frank Gore. The dude is a survivor, I’ll give him that. He’s going to end up in the Hall of Fame, too. But he’s been just a guy for so long now. gfoster: Neil wrote about this recently. Is this Patriots team just not intimidating? Gronk’s “defense” is getting the headlines, but he had a big game offensively Sunday. There’s no doubt the offense is world’s different when he’s healthy — and it’s hard to remember a playoffs when he was remotely healthy. Salfino: The Patriots’ problem is that they lacked offensive upside. But then Tom Brady really looked like the Brady of old vs. Old Brady. Gronk got rolling. Gordon was hyper-efficient. The running game was trash, but that’s sort of old-school Patriots too. Even the defense struggling seemed normal. But losing that game was not normal at all. If you told me New England was going to lose, I’d figure it was their offense flagging the game. neil: Although it’s worth noting they forced zero turnovers against a Tannehill Phins offense. sara.ziegler: That’s sort of the beauty of those lateral plays actually working: It’s a fluke, not a systemic problem for them. neil: But this is definitely the type of toss-up game they usually find a way to win, not lose. sara.ziegler: For sure. Which is what made it so fun! 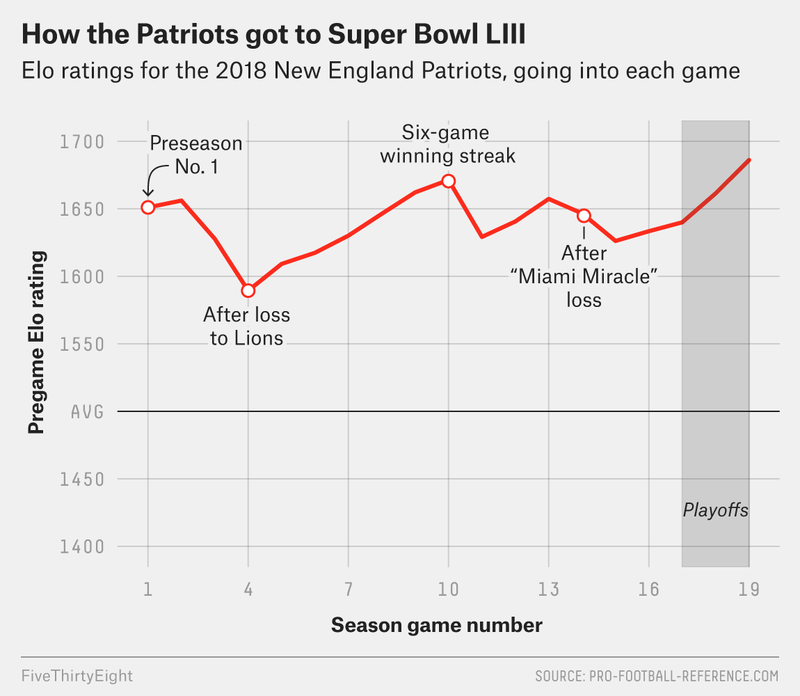 neil: At least for 31 fanbases searching for Patriots schadenfreude. Salfino: I really thought one of the Patriots and Steelers would emerge in the AFC, and now maybe both of those teams are going to be playing wild-card weekend. gfoster: There are four AFC teams at 7-6: Ravens, Colts, Dolphins, Titans. Which one of those is going to make the playoffs in your eyes? Or will it be the Browns, Neil? neil: They’re “in the hunt”! For the first time in approximately 30 years. Salfino: I think the sixth team in the AFC will be the Colts. Andrew Luck is totally out of his shoulder issue and throwing the ball downfield. T.Y. Hilton has nearly 600 receiving yards in the past four games. Luck-to-Hilton is maybe the most lethal combination in football right now. neil: For what it’s worth, our model thinks the Ravens still have the best chance at 55 percent. sara.ziegler: I like the Ravens. They were super unlucky to lose to the Chiefs. Salfino: The Ravens did everything right on defense. Tyreek Hill takes standing eight counts with three different injuries. And you look up at the end of the game and Mahomes has nearly four bills and the Hill has 139 receiving yards. Spencer Ware looked very dangerous. How can anyone stop the Chiefs? neil: Maybe Aaron Rodgers could. But certainly only one QB on a playoff-bound team. neil: That might not have even been Mahomes’ most jaw dropping pass of the day! gfoster: I would normally say here that the Chargers could hang with the Chiefs and look like the AFC’s Super Bowl-bound team. But that was a somewhat lifeless effort by them Sunday. Against Jeff Driskel and probably the worst defense in the NFL. sara.ziegler: I guess we’ll find that out on Thursday, when the Chiefs and Chargers play. Salfino: I thought it was going to be typical Chargers. But maybe typical Chargers is having easily the second-best team in the conference and somehow being the fifth seed. As for the Bengals performance, it fits the “letdown game” theory between Pittsburgh and Kansas City. gfoster: Although, it should be noted that Mike Badgley hit four of four field goals, including a 59 yarder. That actually ties the total of made Chargers field goals for the last two seasons. Salfino: How is Hill going to play that game on Thursday? He was like Rocky on the stool at the end of that Ravens game. The thing about the Chargers that’s weird is their pace of play. They were 29th in plays before last week and then put up another relatively low play count. Could Mike Tomlin get fired if the Steelers miss the playoffs? Should he? sara.ziegler: Not in light of the Le’Veon Bell mess, I’m guessing. The Steelers’ running game was nonexistent, with no James Conner even. Salfino: Has Bell’s absence even hurt the team? Sunday was the first game you could say they lost because of it, arguably. But the defense could not stop Derek Carr. Think about that sentence in the context of this year. gfoster: I don’t think this Steelers team is very good. They now have the Patriots and then AT the Saints. They could easily be 7-7-1 going into final week. sara.ziegler: I’ve been amazed all season at how high the Steelers’ Elo was. 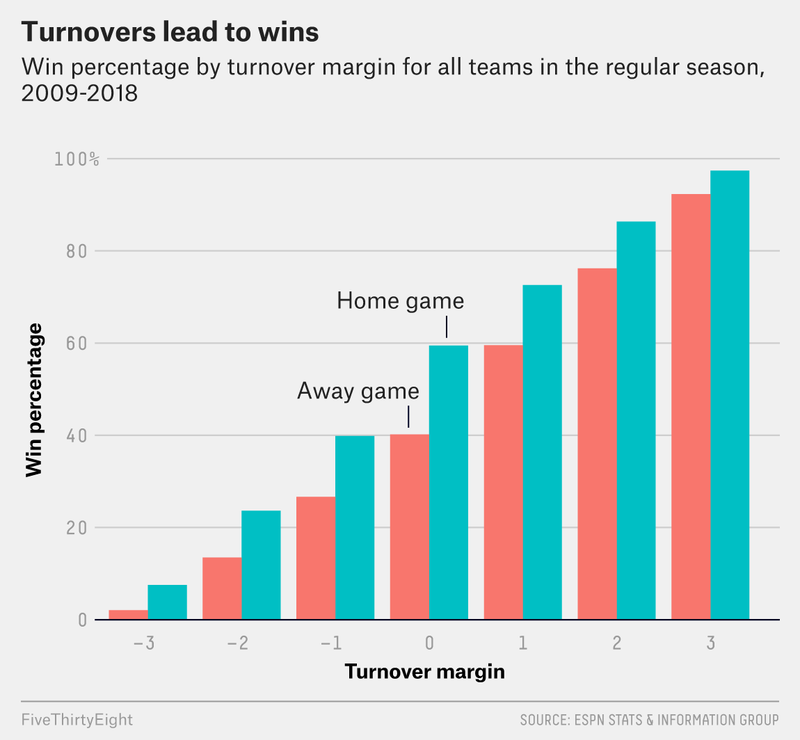 But they just kept winning — until the past three games. neil: Looking at our Elo, though, the Steelers usually pick up steam late in seasons. They haven’t had a swoon like this since 2012. And that year they could pin it on Charlie Batch starting some games. Salfino: Explain to me how Roethlisberger goes 25-for-29, the Steelers defense is still near the top of the league in yards allowed per play, and they lose to the Raiders. Tomlin totally blows the end of the game by not calling a timeout, he gets his own lateral play to work, and then the kicker falls down. sara.ziegler: Field goal kicking has been about average this year, at 84.2 percent made. But this week was a bad one for kickers, who made only 42 field goals out of 56 attempts. Salfino: Steelers vs. Patriots is the game of the week, but not for the reasons we thought going into the season. These are two desperate teams now. The Steelers are teetering on elimination, and New England can’t win the conference without a bye, IMO. Do you know how hard it is to pass like Roethlisberger has this year and have a top defense in yards per play and still struggle to win? gfoster: They haven’t beaten a truly good team this season. Especially now that we can safely call the Panthers a bad team. The Steelers’ best win was arguably over the Browns! Salfino: They really should have beaten the Chargers, though. But you’re right. sara.ziegler: And they would have beaten Oakland, if not for their kicker falling down. neil: … another really bad team. Salfino: Are we worried about the Saints? They did not really bounce back at all offensively from last week’s loss to the Cowboys. You have had the feeling all year that Sean Payton was worried about the depth of his receiving corps, and they had nothing other than Michael Thomas on Sunday — and Thomas really had to grind it out. Nothing in that game against a terrible Tampa defense was easy, which is shocking. gfoster: But on Thanksgiving, we were singing the praises of Brees’s ability to throw TD passes to four different guys who walked in off the street and put on Saints jerseys. Salfino: I think the Saints defense is underrated now and the Saints offense is overrated. gfoster: Where are Austin Carr, Keith Kirkwood, Tommylee Lewis and Dan Arnold? Salfino: Arnold was inactive on Sunday. Crippling loss. That quartet sounds like a country rock band lineup. neil: Are we rattling off Saints WRs or members of the 1973-74 Cavaliers? gfoster: Brees and the Saints are always bad in Tampa, it seems. Kinda like how Brady always seems to struggle in Miami. What is it about Florida? Salfino: The Saints really pulled that game out of the fire and it was huge. Could give them the No. 1 seed, and I think they really need it. gfoster: Here’s a question: If we could switch the results of one of the narrow losses in the first eight weeks, are we talking about the Giants as a sleeper playoff team? neil: People are talking about the Giants as a sleeper playoff team NOW. gfoster: They have two wins more impressive than Pittsburgh: at Texans, Bears. Salfino: Eli Manning is going to resign the Giants into giving him a lifetime contract. He is sucking all hope out of their prospective QB search. Eli is the Frank Gore of QBs. neil: Sara and I theorized that Eli paid Kyle Lauletta to keep screwing up. Salfino: Eli’s last four wins were against opposing QBs Mullen, Fitzpatrick, Daniel, Sanchez. sara.ziegler: My favorite thing in football this season is how bad the Giants are at tanking. Salfino: Exactly! It’s not that hard. sara.ziegler: Remember when the Giants basically didn’t play Saquon Barkley in the second half against Philly? And handed the Eagles that game? Salfino: Although the Jets would have the No. 1 pick right now if Sam Darnold didn’t mess it all up by winning. neil: Broadway Sam can’t help himself. gfoster: A lot of teams are struggling to tank. These guys need to watch more NBA. The Niners won’t quit. Salfino: What about Josh Allen’s insane running. This is not a sustainable QB model, or am I wrong? neil: Did I read that Allen broke a Mike Vick rushing record Sunday? Salfino: No QB ever had two consecutive games of 99+ yards rushing (in the modern era anyway), and now he has three. gfoster: He seems like he’s looking to run. 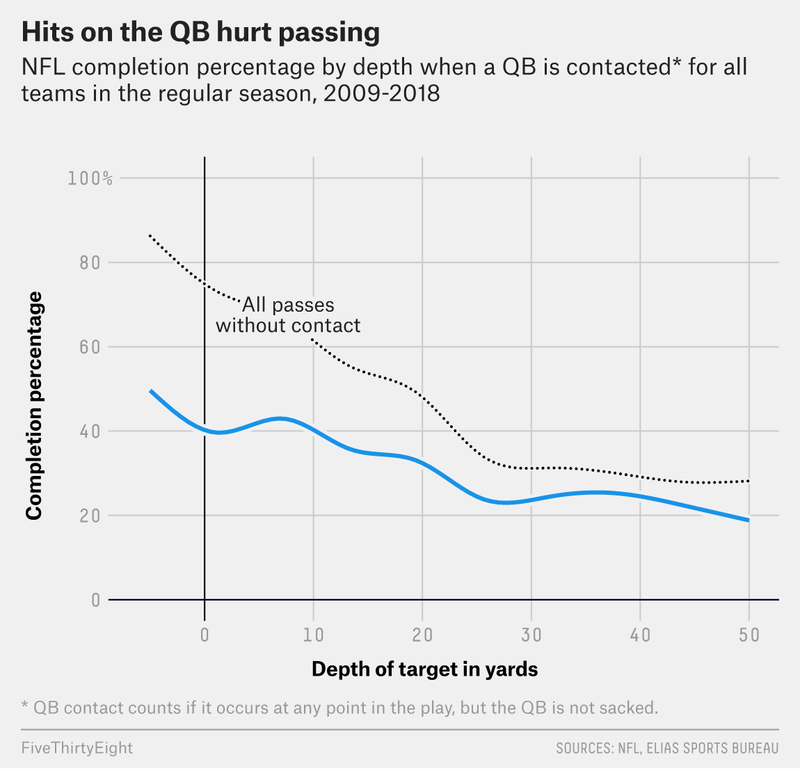 You watch a QB like Watson, Rodgers, Mahomes — they are so reluctant to do it. Always have eyes down the field until they physically cross the line of scrimmage. Salfino: My theory with Allen is that his running is so effective and reliable that it’s hurting his development as a passer. gfoster: He also has the worst supporting cast of possibly any QB ever. Salfino: Darnold escapes to throw and not run, too. Especially on his touchdown pass Sunday, which was an incredible play. sara.ziegler: Allen is like Bizarro Mahomes. Salfino: Sara mentioned the Eagles. Is their window closing? They’re going to have to rebuild their defense, which is bereft of impact players. Their skill players are mediocre. Alshon Jeffery is not a No. 1 receiver, remotely. Suddenly their team-building seems suspect. sara.ziegler: They had seemed to be playing better since that walloping by the Saints. But maybe not so much. neil: Will we look back at 2017 as a weird, one-off year in general? Eagles take advantage of a strange hiccup in the general arc of the game? Salfino: Especially winning with Foles. Salfino: The Cooper trade is going to go down in history as the best in-season deal. He was the missing piece. Everyone else is now in the role that they are suited to be in. Dak Prescott was explosive Sunday. I can’t believe I’m saying it. The bug for the Cowboys was supposed to be their decision-making by Jerry Jones and his family, and that’s turned out to be their strength. Seriously, name the team that’s drafted better recently than the Cowboys. Now add Cooper to this. God, I hate myself for saying this. gfoster: The issue with that trade was more relative to the wide receiver market. Golden Tate, Josh Gordon and Demaryius Thomas were all traded for a far smaller return. The difference is that prior to the deal, I would have lumped Cooper in with that tier of receiver, but it’s possible that his problem was even more Derek Carr than I thought. Salfino: My view is that Cooper is an explosive player who can take the top off the defense. Those other guys, including Gordon now, cannot. gfoster: OK, before we go, I want to get in one college football question off the big news of the weekend: Did Heisman voters get this one right? Salfino: Oklahoma somehow pulled a Favre to Rodgers in college football. sara.ziegler: I’m still kinda shocked that Kyler Murray won. It really came down to performances in the conference championships. neil: It’s funny because the Tua-is-unstoppable narrative had been in place for like two months (or more). Yet the signs were there that Kyler was a legitimate threat to him. He had a better NCAA passing efficiency, better QBR. Betting odds even favored Kyler on Saturday AM. Salfino: My take is that Alabama would be great/No. 1 in the country with pretty much a typical college QB, but Oklahoma absolutely must have Murray to rank where they are. So Murray is the MVP of college football for sure. gfoster: Here’s the flip side of that: Tagovailoa barely played in the fourth quarter most of the season, while Murray was needing to score 40 to 50 points every week to beat any team. Salfino: I’ve heard the draft people concede the Murray would be a first-round pick. Now the question I guess is how high? There are no rules anymore after Baker. gfoster: And, likewise, Mahomes coming out of the same Big 12 nonsense football that looks like two 11-year-olds playing Madden. Salfino: If Murray is a top-five pick, the financial calculus changes dramatically. He may never get another MLB contract. Look at ninth-overall picks in history, for example. neil: Yes it does change the formula we looked at here. Quickly give me the Week 14 Super Bowl prediction and No. 1 overall pick prediction, since we have a legitimate race this year. neil: Although who knows! We’ll see tonight. sara.ziegler: I still think it will be the Chiefs out of the AFC, but who knows from the NFC. Even after last night, I just can’t get behind the Bears. gfoster: Sara, just pick the Vikings, it’s fine. We will forget about it. sara.ziegler: I can’t. The moment I do, it’s over for them. Betting on Andy Reid in January though and the Chiefs in January at home, yikes. sara.ziegler: I’ll take a long shot for the No. 1 pick with the Jaguars. That’s a team that looks like it does not care. neil: I will speak for the model and pick the Saints coming out of the NFC. We have them at 26 percent to win it all. AFC favorite is Chiefs, though I share Mike’s concerns there, despite my crush on Mahomes. And I’ll go with the Cardinals at No. 1, our model’s pick for the worst record. Simulated ties included as half-wins. gfoster: I’m saying Saints over Chargers. Cardinals with the first pick (they have at Seattle and Rams still). And if the Chargers get drilled by the Chiefs on Thursday, I will sneak into WordPress and delete all of this. Todd Gurley is off to one of the hottest starts in NFL history. After rushing for a league-leading 623 yards and nine touchdowns — plus 247 receiving yards and two more TDs through the air — Gurley has accumulated the fifth-most adjusted yards14 from scrimmage through six games since the 1970 AFL-NFL merger, joining former Rams greats Marshall Faulk and Eric Dickerson near the top of the list. 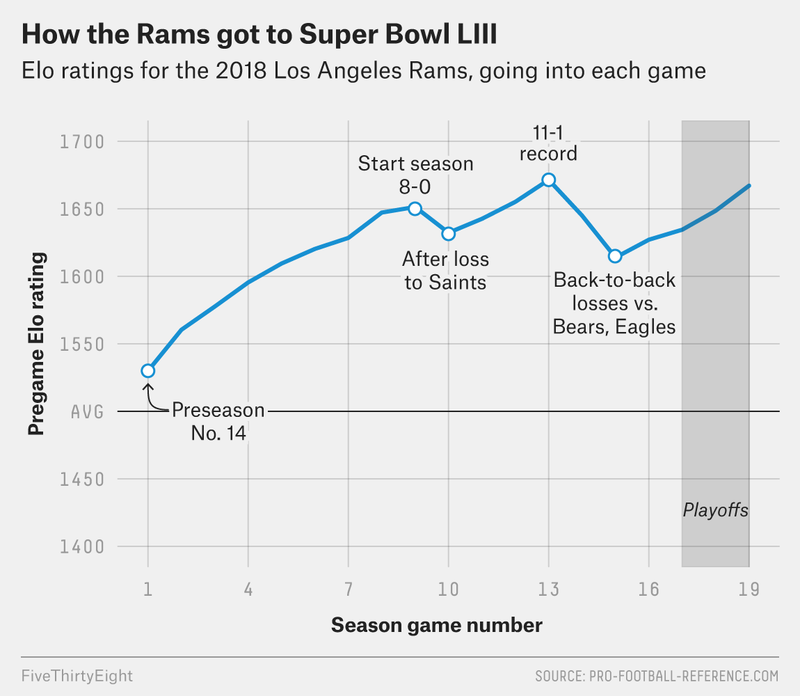 The Rams are 6-0 on the young season, and Gurley’s breakneck performance is often cited as a catalyst for the team’s success. He has even been in the early discussion for league MVP. 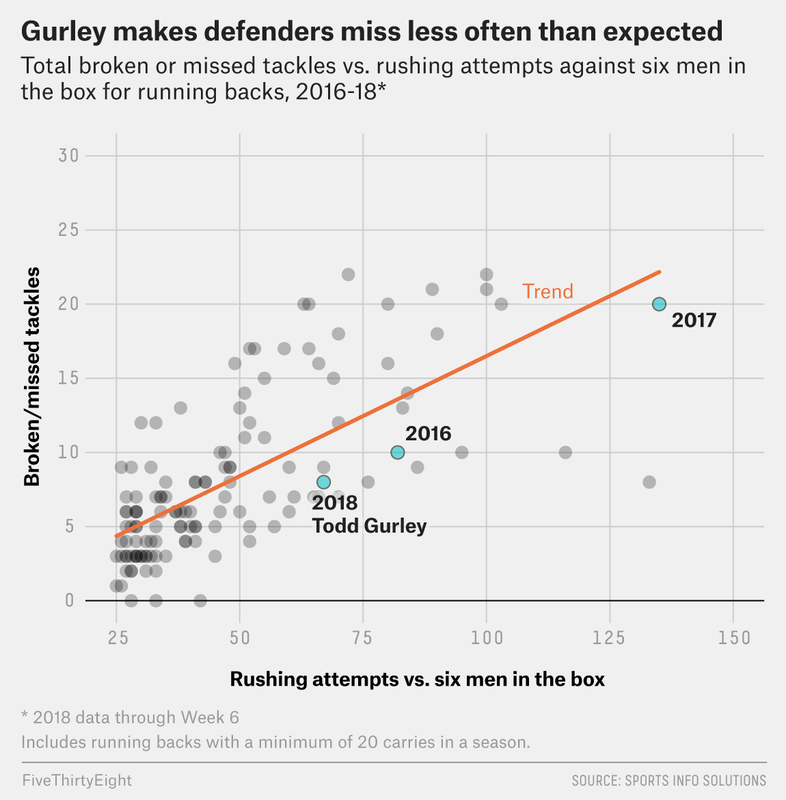 There are other benefits from repeatedly giving the opponent the same look, however, and they affect Gurley’s performance in important ways. When a team can spread a defense out laterally across the field, it opens up the middle and makes running the ball easier. Running backs with at least 20 carries averaged 4.75 yards per carry against six men in the box from 2016 to 2018.15 That’s well over half a yard higher than the average of 4.09 yards per carry when that same group of runners faced seven defenders near the line of scrimmage. Against eight-man fronts, the average gain falls to 3.59. Facing a loaded box makes running much more difficult. Gurley is basically the same back he has always been since he came into the league. If you use broken and missed tackles as a proxy for talent,16 you can see that Gurley makes defenders miss when running against six-man fronts far less than expected. He thrives, like most running backs, when he’s allowed to hit open holes and get to the second level relatively unscathed.